Trieste is still an essentially practical and functional city, yet has a vaguely romantic streak. Modern Trieste - which is what we still see today since little or nothing has changed in the urban layout - arose with the final approval of the Plan of a New City on the Salt-pans of Trieste in 1736, a cornerstone of the forward-looking political and economic development actions of Charles VI. In fact, the great plan for Trieste, which was to become the primary southern port for trade with the Balkans and Eastern Mediterranean (the northern port was Antwerp), began on 18 March 1719 when it was declared a free port. Projects to build port structures, factories and shipyards, as well as the careful construction of the social fabric of the new city, began immediately, with a few interruptions. In 1740, Maria Theresa became empress. As soon as the conflicts ended in 1749, she signed a 55-paragraph Directive specifying full guidelines for the development of the city and commerce - nothing was left to chance. There are provisions for everything, from the regulations for justice and excise duties to the sizes of buildings according to their intended use. It also includes the interesting idea of providing incentives to build on lots - the state guaranteed the land and respect for customary practice, and the citizens built. 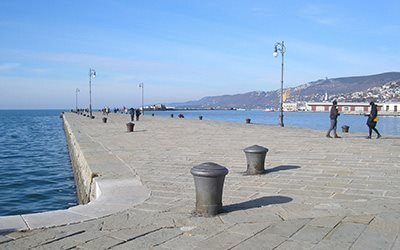 At the same time, through a series of intelligent and astute edicts, Trieste attracted Greeks, Jews, Armenians and other people who were highly active in commerce and best suited to found a new commercial hub. Neoclassicism was undoubtedly the style of the era, but the unique and congenial version created by the residents of Trieste was almost a political choice - the style represented, better than any other, who they were and their way of life. In Trieste, an emphasis is placed on substance, resulting in Neoclassical architecture in which the decorative aspects are primarily on the façade. In the interior, art gives way to functionality and practicality. The first Neoclassical building was constructed in 1798 by Demetrio Carciotti, a Greek merchant. The New Theatre, Stock Exchange, Tergesteo and numerous private buildings followed.